"I had too much fun." Eleanor Friedberger’s latest record, Rebound, transports listeners to an entirely new destination: Athens, Greece. The artist, who was born in Chicago and spent much of her career in New York as one-half of the Fiery Furnaces, is half-Greek, and uses her time spent in the country to explore new sonic territory on her fourth solo release. Though packed with artificial sounds, featuring elements of 80s goth-pop, Rebound is warm, vivid, and groovy; reminiscent of the city where Friedberger spent two months having “too much fun.” In her recent Paste Studio session, she played three songs and discussed how her time in Greece influenced the album. “I was feeling kind of disappointed in my life, and I think a lot of people were at the same time,” she said. “When I went to Athens in January of last year, I really wanted to get out of this place. Rebound is filled with cool, sparkling sounds, including the bouncing dance track “In Between Stars.” For Friedberger, visiting the Athens venue provoked romantic nostalgia for the days when seedy nightclubs populated New York. “It felt like the kind of place I imagined would be in New York City in the 80s, but I never got to experience that. I still have romantic ideas about New York, and the places I could have gone to, but no longer exist,” she explained. “That kind of atmosphere still exists in Athens. Sometimes for sad reasons, because of the economic crisis there, but it feels a bit lawless in a way that I think is poetic and romantic. 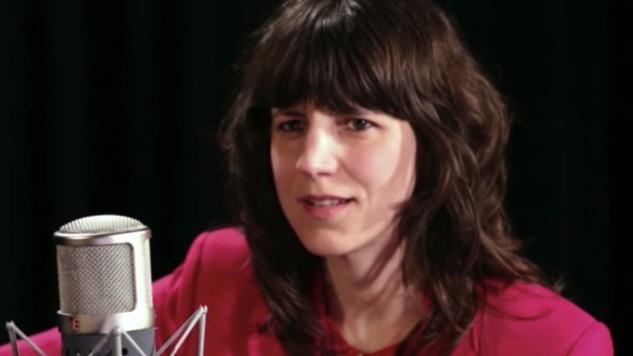 Watch a stripped-down, piano version of “In Between Stars” below, and watch Eleanor Friedberger’s entire Paste session right here.